Barye is best known for his superb bronzes such as Cheval Turc, Theseus Slaying the Minotaur, Roger and Angelica on the Hippogriff, Lion and Serpent, Tiger devourant un Crocodile Ganges. Along with those models, Barye did a few decorative objects such as this wonderful Clock. This is a fabulous piece, a Miroy Freres, Paris Clock surmounted with the 1843 bronze of Barye's Stag Seized by a Wolf. 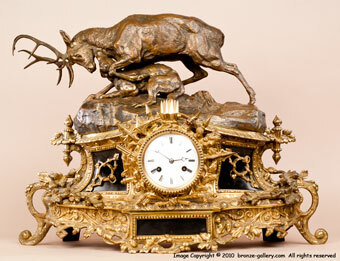 The clock is made of Ormolu bronze mounts and hand carved panels of black Belgian marble inset on the sides and front. The Clock dial is white porcelain and inside the Clock is stamped "Miroy Freres Btes SGDG A Paris". 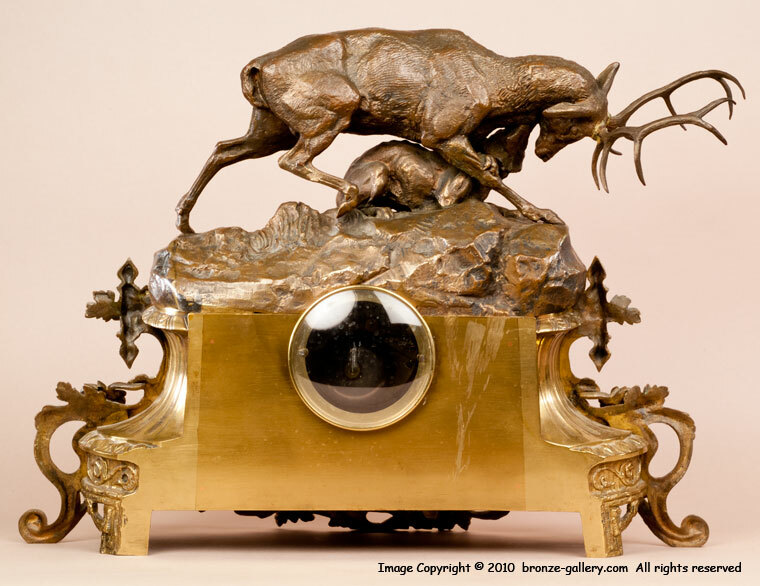 The Clock measures 21 inches long by 16 inches tall (53.4 cm by 40.7 cm) and the Barye bronze measures 19 inches long by 9 inches tall (48.4 cm by 23 cm). 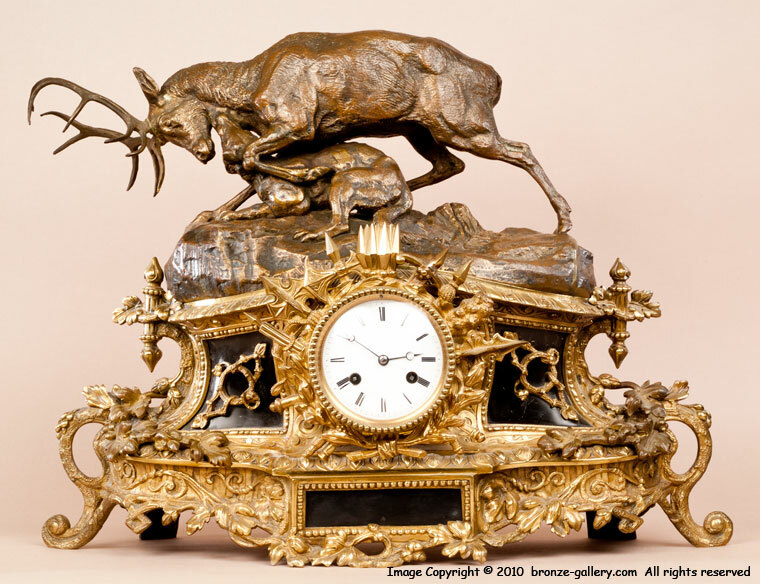 Most of Barye's decorative objects are small so this fine large Stag and Wolf Clock may have been a special commission and it is probably unique. Miroy Freres was one of the best Clockmakers of the 19th century and Queen Victoria purchased 5 of their sculptural mantel Clocks in 1855. The company also won a Medal in 1851. 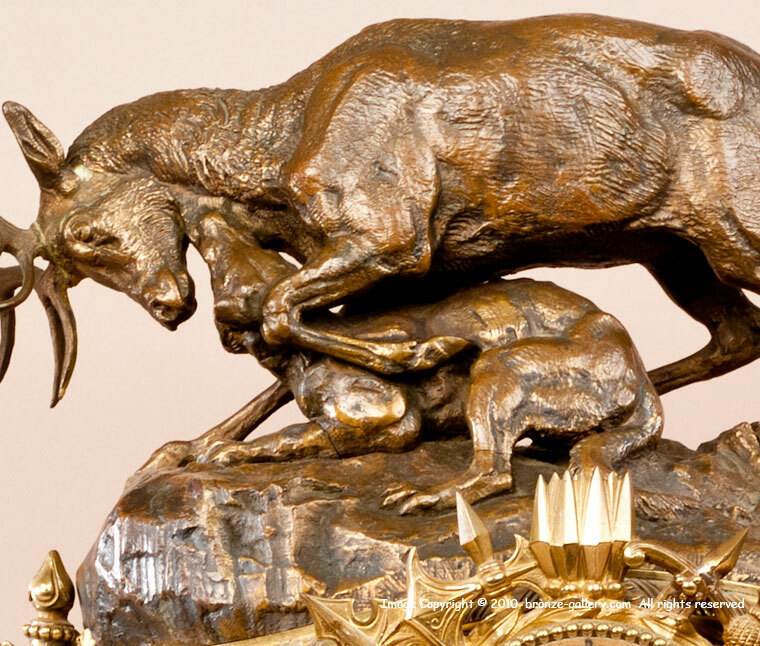 The Barye bronze is made for the Clock, the base is specially fitted to the Clock and it is a superb original cast dating from 1843. The fur detail in the Stag and the Wolf are wonderful and this bronze is a rare model in its own right. A rare masterpiece.